This is a very assured and compelling debut novel, complex and rich. It follows the life of Alice Hart, who we first meet as a child living wild between beach and cane field with her mother and abusive father. After a catastrophic fire in which her parents die, she is taken inland by a grandmother she has never met to Thornfield Farm. This is a place where troubled women put their lives back together raising native flowers. It’s a healing place, but not without a legacy of sadness and violence. Grandmother June has made decisions which precipitate undesirable outcomes. There are secrets she won’t talk about. When Alice - now grownup and managing the farm - finds out why her Bulgarian boyfriend abandoned her years before, she feels betrayed and as flooding rains ruin the farm, she drives west, ending up as a park ranger at a sacred Aboriginal site in the red desert, determined to shape her life freely. There, she falls completely in love with Dylan, another ranger. As often happens in life, history repeats itself. Dylan is abusive. This part of the book is especially convincing: Dylan’s self-justifications and Alice’s desperate attempts to not provoke him as she loses her ability to see the situation objectively are saddening, and we fear for her safety. Suffice to say that Alice finds her way back to the coast and to nurturing Sally, the woman who sat by her bedside many years ago. Alice finally gets to know the family secrets that were hidden before. The book is filled with great characters from varying cultural traditions, providing rich symbology. Also fascinating is the language of flowers. Based on the Victorian tradition, meanings are given to Australian natives which inform the various themes of the novel. Outstanding work. This book not only has the most gorgeous cover but also a beautiful story of loss, love and redemption. 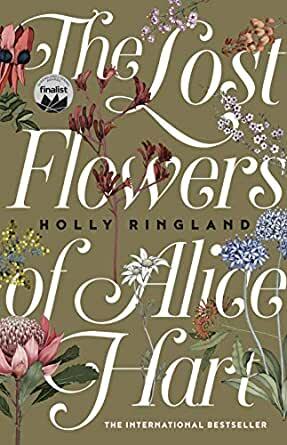 ‘The Lost Flowers of Alice Hart’ is a touching coming of age story featuring three very unique and stunning Australian locations and taking the reader on a sublime yet confronting journey. Alice Hart has been growing up with a volatile, often violent father and her quiet, shy mother on a remote coastal property in tropical Australia. Forbidden to venture into town and home schooled, her only friends are her dog Toby and the fictional characters out of the books her father occasionally brings home for her from the town library. 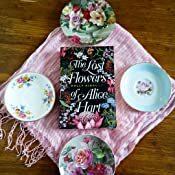 Her mother, bruised and shattered by her host and finds refuge in her garden, where she teaches Alice the magical language of the flowers growing there in abundance. One day, after a particularly bad rage, an unthinkable tragedy happens, one that will leave Alice an orphan and change her life forever. Alice is sent to live on a flower farm with the grandmother she never knew she had. There she discovers not only the language of flowers but a whole new family of damaged women given refuge and purpose by her grandmother. Although Alice grows up loved in a happy, caring environment, her overprotective grandmother keeps secrets about her family from her and discovery of a lie will send Alice fleeing from all she loves, as far as she can get, into the western desert. There she discovers a different sort of beauty in the land and plants that grow there. She starts to document the flowers she sees and what they mean but then falls in love with a man not unlike her father who is cruel and controlling. Eventually with courage and love Alice finds her own way back to her first home and starts to heal and transform into the woman she should be. Sometimes heartbreaking and at other times uplifting, this is a story about family, loss, regret, love and secrets. More than anything, Alice wanted to find out her own story, but it was the secrets kept by those who loved her most that prevented her from discovering who she was and where she came from. I can't believe this is the authors first book! Its divine. I can picture each character. I can feel their pain, their love and their stories. While some of the content matter is heavy it is a beautiful book. Please be a follow up. I can see this book being made into a beautiful short series or movie. I loved it. Started slowly and maybe the childhood was a bit drawn out but there was something there that kept me going and I truly enjoyed this book. Very well written with good relationships and bad, loved the majority of the characters and the Aboriginal wisdom, loved the flowers interwoven throughout the book. Well worth reading. I chose the above title because for for the story of Alice Hart life began like a stormy day, dark, cold and unpredictable. The fog described Alice's life, searching for answers no one would give. Finally the Blue Skys, when everything Alice sort after became real. Love, family, friends and belonging. A brilliant read, with so much interesting information about Australian flora (plants) their meanings, habitats, combined with the characters and story line made this book one to remember. From the coast to the bush to the red centre, the colour of Australia is beautifully depicted. Alice’s struggles and self growth are interwoven with the Australian native plants and their symbolism. 5.0 out of 5 starsBought Twice! An absolutely wonderful read. I loved it so much after I bought it on Kindle that I bought a hard copy to give out at my end of year book club gift. This book is the best I have read in a couple of years. It broke my heart and made me feel sick with loss but was so beautifully written with an incredible ending.